: These trebles are high carbon fine wire and very similar to the VMC 9649 which is currently unavailable in small sizes red tinned. These are the best substitute we have found and are highly recommended for replacement of tail hooks, especially on natural coloured lures. Please note these are continental sizes which are smaller than UK sizes. 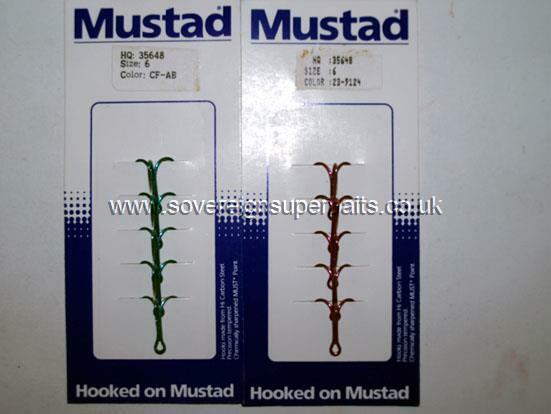 , apart from being used extensively in Salmon and other game fishing are also used on Sosy’s and can be purchased as replacement hooks. These hooks are also used on a number of Tuna lures and we stock the VMC 9508BZ in the sizes below. Mustad / VMC / Eagle Claw Wrecking Trebles, 10Pack. We buy from all 3 companies and reserve the right to supply whatever is in stock at the time of order. : VMC 9649 pattern trebles are short shank, wide gape with a smaller than average barb. Made from high carbon steel, are relatively thin wire but extremely strong. The thinner wire makes them better penetrating and I have personally changed over to this pattern hook on all my personal pirks and have found my hookup rate when wrecking has literally doubled. On pike lures / hard baits these hooks tend to make the lures almost self hooking with very little pressure needed on strike for a successful hookup. Also when used as a tail hook on the natural Sliders and Fatsos there is just enough reflection / glint on a sunny day to make them look like red fins and several of us have found that this improves strike rate by up to ten fold. In short I can highly recommend these hooks from personal experience. : All trebles are bronzed Eagle Claw unless otherwise stated. 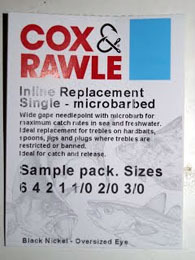 They are 2X as standard & come from a company that needs no introduction & is a leader in the world of hooks. These super strong, black chromed "in line" replacement hooks are one of the best fishing tackle innovations of the 21st century, their micro barb makes CATCH & RELEASE a piece of cake. With just one point to unhook they are also quicker to unhook, giving you more actual fishing time & less time with the forceps, on your knees trying to get "all" the points of a treble out ! I have heard people say that with singles you have a lesser hook-up rate, this is total rubbish "IF" you select the right size. On plugs you can afford to go one or even two hook sizes larger as you have shed the weight of two & three quarter hooks for every treble you remove. Correct placement is however essential, for plug fishing the rear hook "Must" face up & the belly hook "Must" face forward, for maximum hook-up. You can however spin the belly hook & sacrifice some hook-up potential to make your plugs 99% weedless, a real bonus in a weedy estuary or over the rocks of a headland. We have all been using single "assist" hooks on pirks for some years now, as it saves about 70% losses over wrecks but still accounts for plenty of Cod & Pollock. On spinners, singles have been the norm for many years especially for Tiger fish who have a small gape to their mouths due to all the teeth & singles have always given a better hook-up rate. It is the law in the likes of British Columbia to use only ONE single & trebles have been banned for some decades now, to protect fish stocks as it is also 99% "catch & release" & ripping a pair of trebles out of the mouth of a greedy salmon can cause a lot of damage to what is actually a delicate fish. 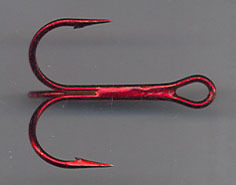 They are 4X as standard & come from a company that needs no introduction & is a leader in the world of hooks. 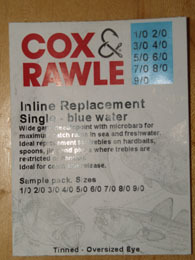 These super strong Tinned, "in line" Blue Water replacement hooks are, like their smaller cousins, are one of the best fishing tackle innovations of the 21st century, their micro barb makes CATCH & RELEASE a piece of cake. These Blue Water singles are specifically designed for big poppers, large stick baits, speed jigs & pirks. With just one point to unhook they are also quicker to unhook, giving you more actual fishing time & less time with the pliers, on your knees trying to get "all" the points of a treble out ! They cause less damage to the fish & less time unhooking means you can get "one more picture" of your "fish of a life time" without causing it any harm. As with the smaller ones I have heard people say, that with singles you have a lesser hook-up rate, this is total rubbish "IF" you select the right size. These hooks are the norm in most of the worlds "popping" hot spots, Oman, Andaman Islands, Cook Islands, Costa Rica, Etc, Etc. While most guides don't insist on singles, they do certainly welcome their use & we have actually been taken to some of their "secret" places because all of us on the boat had singles on our lures, or singles & pliers in our tackle box & were able to swap them over. : pattern number:-35648 lure replacement Trebles. Available in Red tin & Blue tin coating. 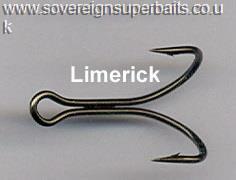 These hooks need no introduction, this is a very well proven pattern and very popular among ultra light anglers.